When most vacationers think of Outer Banks vacation rentals, they don't normally consider Manteo, a small, almost-inland town located a few miles off the popular beaches of Nags Head and Kill Devil Hills. However, Outer Banks visitors who crave a vacation that's rich in local history, gorgeous waterfront landscapes, and exceptional fishing should definitely peruse through the bevy of vacation rentals that are available within Manteo and its surrounding communities. In Manteo, visitors will find themselves at the cultural heart of the Outer Banks, surrounded by some of the region's best attractions, including the North Carolinas Aquarium, the Elizabethan Gardens, The Lost Colony outdoor drama, Roanoke Island Festival Park, and many other incredible sites that have put the tiny town of Manteo on the international map. However, at its core, Manteo is a small-town waterfront community that is bursting with southern hospitality, exceptional restaurants, and eclectic art galleries, and visitors who crave a unique coastal scene that is relaxing, entertaining, and completely unique, should definitely check out the vacation rental options available in Manteo. Filled with fun activities and diversions both on and off the water, Manteo is an ideal destination for anyone who wants to escape the real world and dive into the iconic and historic culture of the Outer Banks. Manteo is located in the heart of the Outer Banks, and is a small island located just 5 miles away from the oceanfront barrier islands. It's separated from the central Outer Banks by the Roanoke Sound, and separated from the mainland by the Croatan Sound, and as a result, has a culture and landscape that is quite unique on the Outer Banks. Though there are no ocean beaches on Manteo, there are plenty of waterfront activities to enjoy. Fishing is an especially popular venture, both off the waterfront docks close to downtown Manteo, and via the multiple marinas that border the Manteo / Nags Head Causeway, the bridge that connects the barrier islands to Roanoke Island, including Manteo and the neighboring town of Wanchese. There are a large number of charter boats at both of these locales that are more than happy to take visiting anglers out for a deep sea fishing expedition via the Oregon Inlet, the closest inlet that leads out to the Atlantic Ocean, and eventually the Gulf Stream located just 15 miles away. Manteo is known on a global scale as the birthplace of English colonization in America, and visitors will notice this pride virtually everywhere they go, from the local street and business names to the town's many attractions. In fact, Manteo has arguably more big name attractions than any other spot along the Outer Banks, due in no small part to its role in history as the first English settlement in the United States. In Manteo, visitors can walk along the exact settlement location of the first English colonists at the Fort Raleigh National Historic Site, peruse the gorgeously manicured foliage of Roanoke Island at the Elizabethan Gardens, or even step back in time with a tour through the interactive Roanoke Island Festival Park. The park is an especially great destination for children, as it features a replica of a settlement village, a neighboring Native American community, and the astounding Elizabeth II, a 16th century sailing vessel that is an exact replica of the boat that the original colonists used to head to the Outer Banks in the late 1500s. Along every step of the way, costumed interpreters are on hand to answer questions and provide demonstrations for curious visitors of all ages who want to learn more about Roanoke Island's first residents of over 400 years ago. Manteo is also home to the spellbinding North Carolina Aquarium, which features a number of exhibits including the state's largest saltwater tank filled with looming sharks and paddling sea turtles, as well as the historic downtown Manteo itself. With the country's oldest family-run movie theater, dozens of exquisite shops and restaurants, and some of the Outer Banks' most esteemed antique stores and art galleries, downtown Manteo is an attraction worthy of exploration on its own merit, and a trip through the beautifully landscaped side streets of historic stores and homes can easily fill an entire day of off-the-beach fun. Best of all, the waterfront landscape is always changing, with vessels of all sizes and styles gliding in and out of the harbor, and boat tours standing by to welcome passengers on board for a cruise along the Roanoke or Croatan Sounds. Clearly, the majority of Manteo's attractions are off-the-beach destinations, but visitors in need of a beach fix will find the shoreline an easy drive away. Cross over the causeway and head north, to multiple public beach accesses managed by the town of Nags Head, or head south to the unpopulated beach accesses of the Cape Hatteras National Seashore and Bodie Island. In either direction, the oceanfront is a 10 minute drive away, and with ample parking areas and even a 4WD accessible beach ramp at Coquina Beach on Bodie Island, Manteo visitors will find ample opportunities to enjoy the renowned Outer Banks' seashores. Essentially, Manteo is a great vacation destination for visitors who love the beach, but who want ample opportunities to explore the Outer Banks' unique culture and indisputable important role in national history. With quiet landscapes that evoke the region's Elizabethan roots, and world-class restaurants and galleries around every corner, Manteo is a unique way for artists, history buffs, and coastal landlubbers to explore the Outer Banks at its best. Manteo offers a number of local hotels, motels, and bed and breakfasts that are designed with short stays and long weekends in mind. These accommodations are perfect for visitors who want a romantic retreat for two in the heart of the Outer Banks' cultural waterfront landscape. With walking-distance access to Manteo's famed attractions, especially the historic downtown, a local inn or bed and breakfast is an ideal retreat for folks who simply want to slow down and enjoy a slice of coastal life on the water. Of course, Manteo also offers a number of vacation rental homes, condos, and townhomes as well, and these properties can be found in varying locations, however, the majority are located close to those gorgeous sound waters. The small causeway island, which is located almost directly in between the town of Nags Head and Roanoke Island, is an especially popular vacation rental retreat, as the communities here feature panoramic views of the Roanoke and Albemarle Sounds, multiple boat docks or individual boat slips for rent, and a fleet of commercial charter fishing vessels to take out anglers on fun fishing day trips in the Gulf Stream. The town of Manteo has a collection of rental homes as well. These properties are generally located on the outskirts of the historic downtown, bordering saltwater creeks and canals that eventually lead out into the open Roanoke Sound waters. Quiet and secluded, these homes are lovely coastal estates that offer a world of shaded privacy in addition to incredible views of the maritime forests and the sound waters that border the perimeter of the property. 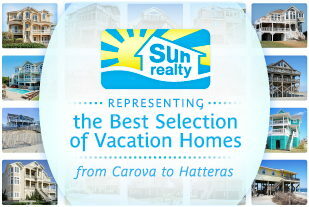 Basically, vacation renters in search of 2-4 bedroom retreats will find ample options in the condo complexes bordering the Nags Head / Manteo Causeway, and vacation renters in search of elite homes in the 4-8 bedroom range will find ample options in virtually all waterfront areas of the town. Naturally, these neighborhoods are designed with fishing in mind, so anglers who are bringing a boat along, (especially a larger vessel), should check out the rental homes available in Manteo first. A number of homes, condos, and townhomes may even offer a complimentary boat slip during a vacationer's stay, making it an easy task to pull up to the docks, and enjoy a full week of Outer Banks relaxation on the water. Of course, you don't have to be an avid mariner to enjoy the charms of Manteo, and anyone who enjoys a great sound sunset or a peaceful shaded locale will appreciate the waterfront vistas and / or the seclusion of Manteo vacation rentals. In Manteo, it's easy for vacationers to sink into a porch swing or deck chair, lean back, and enjoy the sound of the water lapping at a bulk headed boat dock. For an Outer Banks respite that centers around miles of peace and quiet, with a little history thrown in, Manteo is a quiet destination that remains an undiscovered Outer Banks treasure. Visitors who choose to enjoy a vacation in Manteo will find themselves remarkably close to some of the Outer Banks' biggest attractions. The Fort Raleigh National Historic Site, Elizabethan Gardens, North Carolina Aquarium, Lost Colony outdoor drama, Roanoke Island Festival Park, Island Farm, and the historic downtown itself are all located within the town's limits, and present vacationers with a week's worth of activities to explore off the beach. The vacation rentals here may be limited as opposed to the more popular beach destinations of Nags Head, Kill Devil Hill and Hatteras Island, but many Outer Banks vacationers consider this an instrumental aspect of Manteo's allure as a vacation destination. In Manteo, visitors can sink into the local culture, enjoy endless views of the waterfront, and completely avoid the feeling of staying in a "touristy" vacation destination. In addition to its seclusion and wild surroundings, Manteo also has an incredible waterfront, with spectacular sunsets, solid Gulf Stream and ocean access for mariners, and ample open water views that are essential to any great beach vacation. This waterfront scene combines with an exceptional congregation of seafood restaurants, quirky bistros, fantastic art galleries, and popular antique stores, and gives Manteo a unique culture that's all its own. Ideal for vacationers who like to forego the usual beach attractions and dive right into the local culture, Manteo is a charming small town that is completely unique on the Outer Banks and the East Coast, and offers vacationers ample room to enjoy an eclectic beach vacation on their own terms. Obviously, the biggest consideration for a potential Manteo vacationer is proximity to the beach, as the vacation rentals in Manteo are located a good 5-7 miles away from the oceanfront shoreline. With that in mind, visitors who want to be able to walk to an oceanfront beach on a daily basis should consider the neighboring regions of Nags Head and Kill Devil Hills, which are within easy driving distance of the Manteo attractions, but feature plenty of vacation rental homes close to the ocean shoreline. Visitors who are bringing a boat along should also check with their property management company to see what accommodations are available to accommodate the vacationing party and their vessel. Some vacation rentals may have a private boat dock and / or boat slip available, while others may have a boat slip available for guests for a small additional fee. Be sure and ask questions beforehand, to ensure that your boat has a home, and can be properly used and enjoyed during your Manteo vacation. Visitors should also note that because Manteo is a year-round home for many Outer Banks locals, the area doesn't really have an "off-season" and many of the shops, restaurants and stores are open throughout the year as a benefit to the local population. In addition, Manteo is home to the majority of Dare County government services, including the DMV, the courthouse, and the administrative buildings, and as a result, there is a steady stream of traffic along business US 64, the main road that goes through the expanse of the town. Granted, the traffic is an inconvenience at worst for folks trying to make a left-hand turn, and most visitors don't even notice the influx in population in between stops at the local attractions. Essentially, as long as a vacationer is fine with a quick drive to the beach to see the ocean, a Manteo vacation rental can be an ideal escape. Secluded, waterfront, and completely fascinating, Manteo has all the key characteristics of a fun and unique beach vacation destination. Make sure you pay attention to the local events calendar, because Manteo offers a world of festivals, events, and seasonal programs that are wide open to the visiting public. Vacationers can enjoy a relaxing watercolor class at the Elizabethan Gardens, try their hand at boat building along the downtown waterfront, or enjoy an outdoor concert performance by the North Carolina Symphony at Roanoke Island Festival Park. This is all in addition to regular events such as Saturday morning farmer's markets or monthly "First Night" celebrations and art crawls in downtown Manteo. Visitors are always welcome to join in, and with so many events offered on a regular basis, vacationers will find themselves with plenty of entertainment options every night of the week. Planning a winter getaway? There's nothing quite like Manteo for the holidays. During the December and January months, the town is decked out in festive decor and features plenty of events, including the month-long Winter Lights event at the Elizabethan Gardens, and the Breakfast with Santa celebration at Roanoke Island Festival Park. With holiday concerts, special shopping discounts, and a waterfront that's illuminated with Christmas lights, Manteo may very well be the best place for Outer Banks holiday vacationers. Visitors who want to take their angling skills to the next level should check out the fishing tournaments available in Manteo, specifically at the Pirates Cove Marina located along the causeway. 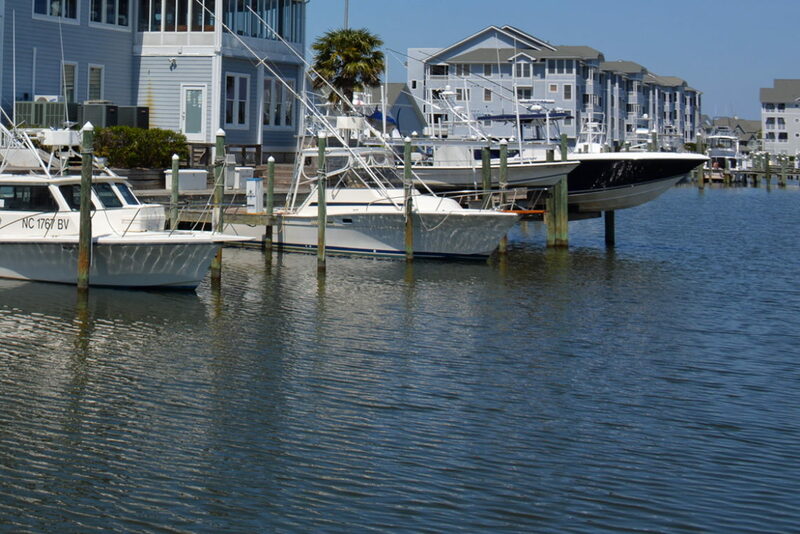 This marina is home to the majority of Manteo's fishing tournaments, including the all-ladies Alice Kelly Billfish Tournament, and a number of world-breaking catches have been reeled in as a direct result of these events. Anglers who love competition and enjoy having an excuse to take the boat out to the Gulf Stream should definitely see what fishing tournament options are available during their Manteo vacation. If you head to Manteo, be sure and bring your appetite! The region is known for its fantastic restaurants, ranging from the quirky and casual to the upscale and romantic, and a number of restaurants in this town have even been featured on the Food Network's Diners, Drive-ins and Dives. For everything from a spicy crab quesadilla to stuffed lobster cooked to perfection, Manteo's dining scene is second to none. Manteo is a unique vacation destination that is often overlooked by even the most avid of Outer Banks vacationers. Located a few miles away from the ocean shoreline, it's easy to consider Manteo as just a quiet offshoot of the Outer Banks beach scene. But look a little closer, and visitors will discover an incredible world of historical attractions, an interesting and entertaining downtown, and a collection of vacation rentals that offer incredible sound views and access. For an Outer Banks beach vacation that is, well, located a bit off the beaten beach path, consider a vacation rental in Manteo. Scenic, historic, and with an endearing charm all its own, Manteo is the perfect respite for visitors who love the water, history, and a first-hand look at the Outer Banks' undeniably unique culture and appeal.